Fortunately for all homeschoolers who enjoy using their computers as educational assistants, software designers never seem to rest! There are great educational products constantly being developed for our Macs and PCs. No matter what topic one wishes to study or teach his/her child, there is a software program to assist. 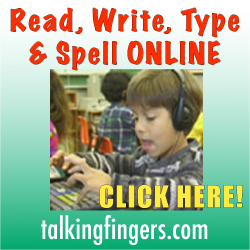 Talking Fingers, Inc. is one of the most innovative software companies in the educational field. From their website: “The Talking Fingers approach is based on a simple idea: text is speech made visible! We use our mouths to talk, to make the sounds of words. We use our fingers (with a pencil or keyboard) to represent those sounds on paper. When children learn to link speech sounds with letters, they can use the alphabet code to write any word they can say. Their fingers are ‘talking’.”. The TFI base program, Read, Write & Type Learning System, is designed for grades K-3, to teach phonics, reading, writing and keyboard skills. With word-processing being so important a part of everyone’s work – whether high school or college students or working adults in all walks of life – teaching this vital skill to little ones is an intelligent move and combining it with other study areas is even better. The beginning segment of the CD edition of the RWTLS!™ program is based upon a game wherein an animated computer villain called Vexor tries to steal letters of the alphabet and prevent the users from writing their stories. Two helping hands, Lefty and Rightway, help the child foil Vexor through 40 entertaining game levels, composing hundreds of animated sentences and stories along the way. The child is rewarded with certificates of advancement after completion of four phonemes (speech sounds). The next section presents letter-blends to the student and reinforces how these combinations create new sounds. Then the child begins working with words that are composed of these preliminary sounds. Thus, they type the phonetic sounds and then type the words that are made of the phonetic sounds. This is a brilliant way to combine the two skills and build a powerful connection between two normally unconnected pieces of information! The program then leads the child to begin reading and writing simple stories that are responses to prompts, then gradually moving into writing his/her own stories. They can gain extra practice in just typing skill in two other sections of the program. Read, Write & Type Learning System also includes special features for children with learning disabilities and/or who are learning English as a Second Language. The instructions do not have to be read — they are provided audibly, clearly and carefully. Also, self-esteem is guarded, so that a child who requires many repetitions of a lesson or takes more time than others, is not made to feel less capable for it. Also, RWTLS is designed to keep the interest of the child who may have difficulty focusing or concentrating. The RWTLS program, since it is typing-based, aids those with dyslexia, who often have difficulty handwriting because they cannot consistently remember how to form the letters. But with typing, that problem is eliminated. This relieves much of the stress a dyslexic person experiences and allows him/her to concentrate more attention on actually creating content, ultimately writing — rather than be stymied and frustrated by a purely motor-skill difficulty.